I learned a couple of really important things designing and constructing this quilt. The first is about myself as a quilter. I learned that I am capable of pushing through the monotony of working with solids, and that the end result is worth it. (I know not every quilter finds solids monotonous, but I personally do). Unlike projects like my gypsy wife quilt, neon sampler, or penny sampler, each block of this quilt was not satisfying in itself. But the end result is definitely the best quilt I’ve made, or at least the one I’m most proud of. It’s an interesting tension – pleasure in the process vs. satisfaction in the result. Now, let’s view them side by side. The design was supposed to extend another half block on top and bottom. 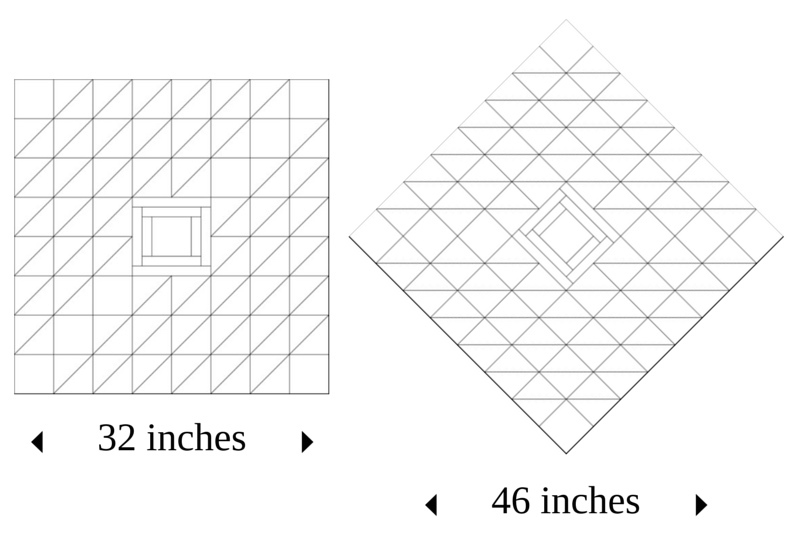 Unfortunately, when I was deciding what size to make the HSTs, I based the decision on the size of the block as measured from side to side instead of on point. The block finishes 32 inches side to side, but it measures 46 inches when set on point. 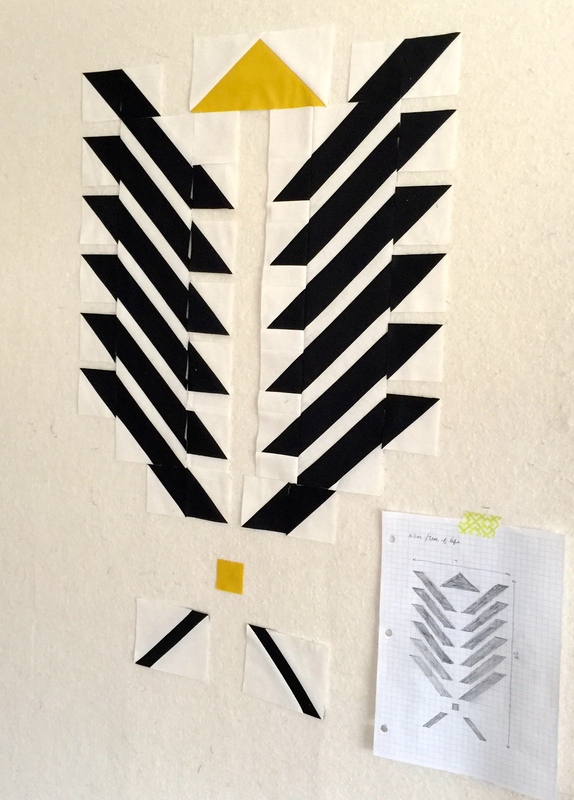 If I had completed the design as planned with the size HSTs I used, the quilt would have been 92 by 138! I was already too far into the process when I realized the problem so I just eliminated the top and bottom of the design. The quilt now finishes 92 inches square. If I could go back I would use smaller HSTs and complete the design as planned. Lesson learned! Of course the question now is how to quilt it. It is a big quilt, and the stakes are high because I’ve already put a ton of time and effort into it. I’ve definitely considered sending it out to be long armed. I’ve also thought about doing multiple colors of Aurifil 28 weight thread in straight horizontal lines. I even briefly considered hand quilting it before I realized how big it was going to be. But for now I’m putting it aside and working on other things, including Kilim II. I’m sure this project is destined to have just as many adventures and learning opportunities as the first. Hey, good to have you back in the blogosphere. That’s a lovely quilt top, and despite the size discrepancy, you can still see it’s the ‘little sister’ of the rug. I’ll be interested to find out what you eventually decide on for the quilting. So good to read you again Sarah! What a remarkable piece, I love seeing what you create. You create such beautiful items that always inspire me. Wow! Your hard work made for an exceptionally beautiful quilt top. Congratulations on pushing through, and thanks for sharing the lesson on quilt math! It’s still a wonderful piece on that we can appreciate! What a beautiful creation! Love it so much!!! And i like the idea of multiple colours in straight lines. But what if you kept the lines within each colour coded section and followed the angles. Does that make sense? Like choose a colour and quilt that colour in only the pink and black section. Then choose another colour and quilt the purple and white section, and so on. Just following the zig zag. The back would be fantastic, two giant squares with giant zig zags! I’m sure whatever you come up with will be fantastic! And the next one… so awesome! Wow!! This is stunning! Congrats on completing this top. 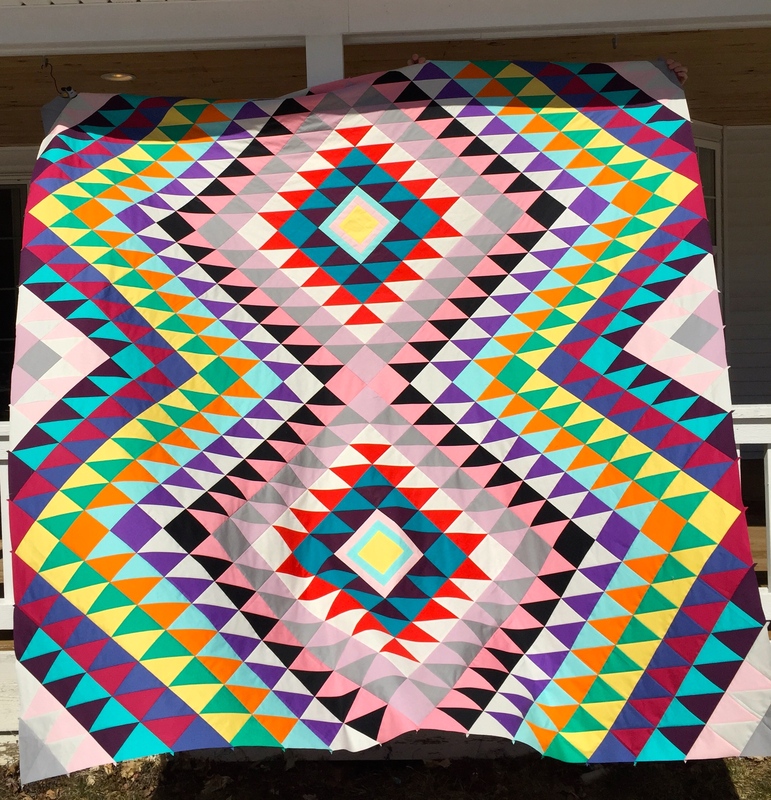 You know…I love this quilt and the colors are stunning. Who cares about the top and bottom things…we would have never known 🙂 I am loving your new design too….welcome to solids club!! Your quilt is wonderful! 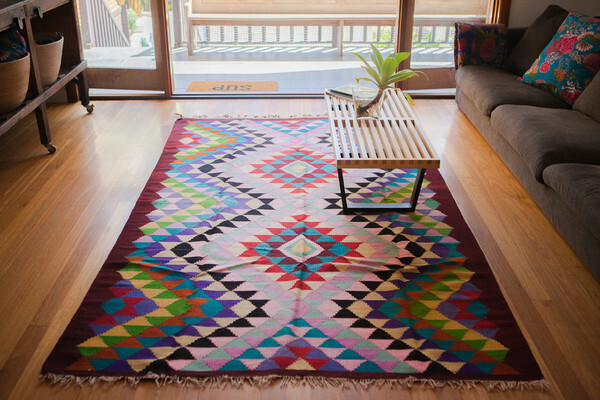 Wish I could afford to buy the rug that was its inspiration! I think that is super cool – you are very very clever!